Sensory tables are a staple of most play-based toddler programs and preschools. Sensory play is basically a large tub full of some loose material, tools for scooping, pouring, and manipulating the loose material, and often other toys mixed in. It is a pure play-based activity, where children can settle in and explore to their heart’s content. If you’re wondering what kids learn by doing this, check out my list of benefits of sensory play at the bottom of this post. 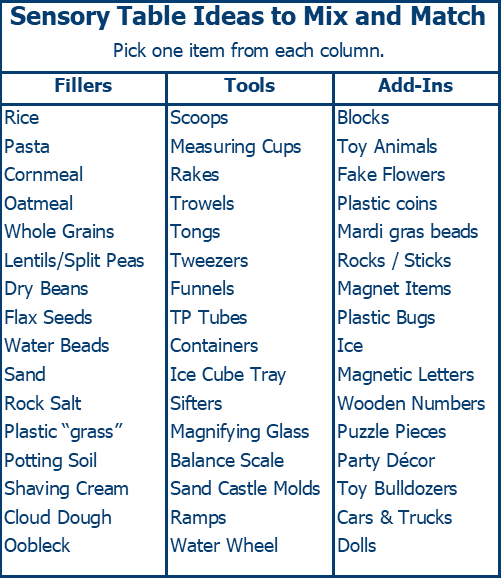 This can be as simple as mixing and matching from the ideas below: Choose a container, something to fill it with, and some tools to try. Decide whether to include add-in items. Note: If you have a young toddler who mouths things, use caution and only choose non-toxic age-appropriate materials from the list below. Rice in all colors (how to dye rice). There’s also the whole world of water play. Learn about those options on my Ultimate Guide to Water Tables post. shaving cream – a little messy for my taste, but kids love it! mesh tubes – one of my co-workers found a “crazy hat” with these orange and green plastic mesh tubes she cut off – so fun to play with! For some of the materials listed above, you can add in scents, like mixing cinnamon into the oatmeal, or soaking a few of the cotton balls in peppermint, or mixing some lavender seeds in with your flax seeds. Start really light with your scents. They can quickly become overwhelming. containers of all sizes and shapes: bowls, buckets, metal pie pans, gift boxes, plastic eggs, etc. 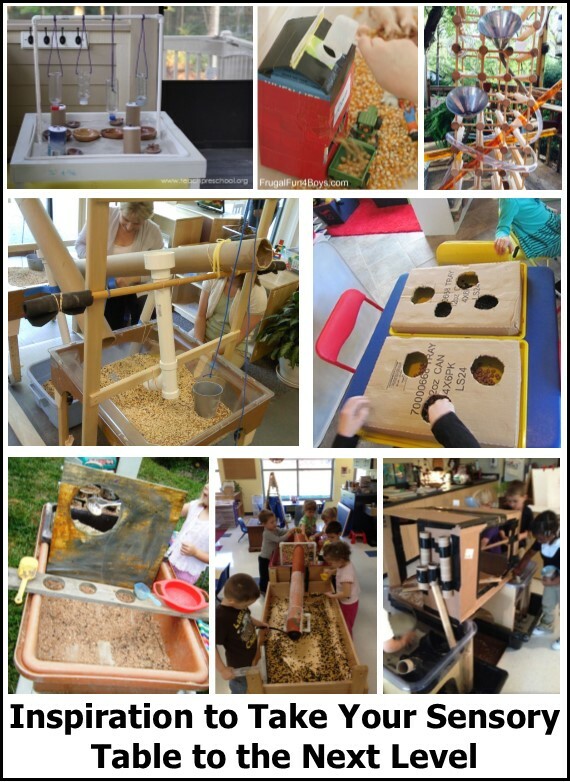 The blog Sand and Water Tables by Tom Bedard is full of fabulous ideas and thoughtful reflections on sensory play. He assembles what he calls an “apparatus” out of cardboard and found materials to take sensory play up a level. I plan to explore these next year in my class. For now, I’m just going to include two collages of photos here to inspire you. The first is collages is all images from Tom’s site. The second is compiled from lots of different sources. I will give links below to sources for all the images. 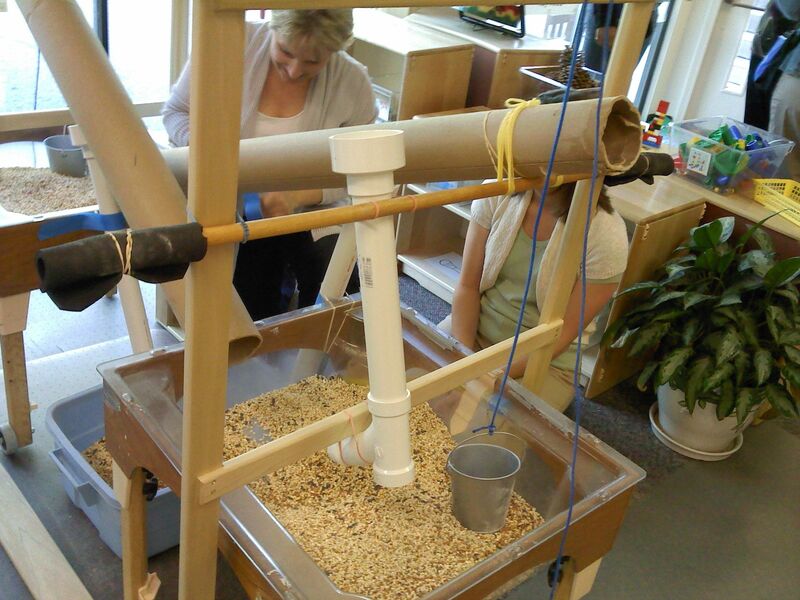 From top left: Hanging sand funnels from Teach Preschool; Grain silo from Frugal Fun. Wine rack and tubes from Nurturing Roots. Poster tubes and PVC pipes: source. Holes in a box from PreK and K sharing. Divider with a hole from Let the Children Play. Tube between tables from Day Nursery Indianapolis. Tubes and funnels from Fairy Dust. Don’t these all look fun? Some common themes with these apparatus are ramps (inclined planes) or tubes to slide materials down, holes to reach through or drop things through, things that block your view of the materials or of your playmates (the increased mystery increases the fun) and chain reactions… pour through here, and it knocks this door open, etc. A simple bin full of rice, scoops and a few containers to dump into can entertain toddlers for hours. But, a sensory bin can really come to life when we mix in other items to inspire imagination or provoke math and science learning. For example, on plants week, a bin of potting soil with trowels and rakes is fun. But it’s so much better when we add in a few plant pots, some lima beans or other big seeds (that are easy to sort out of the soil later) and little signs to label what they’ve “planted”. On cars week, we use kinetic sand and shovels to make mountains and trails with, then add in toy monster trucks with big treads on their tires to lay down tracks. On a hearing / sounds week, you could use dried beans or popcorn kernels with metal pans and cymbals where they could bounce the items off the metal for that metallic “tink” sound. When we study animal adaptations and habitats, we use sensory materials for our “bird beak adaptations” activity and for a camouflage themed activity where we offer plastic animals to hide in various materials. In States of Matter, we freeze toys in a big chunk of ice, and the kids work to excavate the toys, using salt and water to melt the ice. Gather a collection of items. Make a “key” listing them all – for younger children, you’ll want pictures of the items they can match an object with, for older children, this could be a list of words describing what they are hunting for. Then bury the items in the filler material. Kids hunt them out and match them to the key. We do this with the “human organs TOOB.” when we study anatomy. On dinosaur week, we bury plastic dinos in shredded paper for the big motor dig, and put real fossils, sand, and paintbrushes in the sensory bin. You could use magnetic letters, foam letters or scrabble tiles in an alphabet hunt. You could toss in puzzle pieces and they would search for all the pieces to complete the puzzle. On Beach week, we fill our bin with sand, buckets, shovels, and seashells. We have a mural on the wall showing a beach scene, and we put nearby books about shells and beachcombing, so they can look up more information on the shells that they find. Small world play is when children use miniature items to act out ideas from real life or re-enact stories. Examples are playing in a dollhouse, or making a pet store with toy animals, or a fairy house with twigs and stones. Mixing in sensory play makes this an even richer learning environment. Learn more about small worlds at: Little Worlds, Big Adventures. For our bridges and tunnels week, we use cloud dough, round wooden blocks to build tunnels around, and plastic animals to live in the tunnels. In Build a House week, all around the room, we are replicating parts of the home building process. Our sensory bin is the excavation stage with toy bulldozers, Playmobil dolls and cloud dough. For Earthquake week, we put plastic fences, trees, and animals in a tray of sand, and give kids a back massager to press against the pan to create an earthquake. For chemistry mixtures, we make corn starch quicksand and put in plastic animals to “run across” or sink into (you could also use this cornstarch and water mixture for “tar pits” in dinosaur week). When we study planets and space travel, we use Mars Rover toys in sand. One of my co-workers is a genius at this. She goes to craft stores, dollar tree, Goodwill, hardware stores, and garage sales, and wanders around and waits for inspiration to strike! Like our fish-shaped soap dishes that leave cool fish-y impressions in the sand… You don’t have to spend a lot of money to find fun add-ins. If you have one or two children who will be playing at a time, you can get by with a smaller container. A cake pan is not really big enough for most sensory play – but if it’s all you have, you can make it work with some. It’s better to use a big plastic tub. (Something like this Sterilite 32-Quart tub which is 24 x 16 inches or a Gift Wrap Storage Box which is 33 x 12.) For multiple children to be able to play, you need more space, such as an Underbed Storage Bin , which is around 40 x 20. You can set these on the floor or kitchen table. If you’ll be using the same tub on the same table a lot, put velcro tabs on the tub and table to help hold it in place. Or some teachers just buy a few bins and stack them on top of each other… the one on the bottom provides a “table” for the open bin to get it up to a good height to play on. Search online, and you’ll find lots of examples of people who have built their own tables. For example: Teach Preschool, A Teaching Mommy’s PVC frame, Pink Oatmeal’s IKEA hack, or this collection of 12 ideas. You can buy some inexpensive sand and water play tables for home use, but most aren’t very sturdy, and when you’re done with them, you can’t re-purpose them for anything else. You’re better off just using a storage tub. But, if you run a preschool or day care or toddler class, a really good sensory table is expensive but is worth the investment. Here’s a few to consider: Wood Designs or Jonti-Craft. That said, while children are playing, you do want to set expectations for behavior and be clear what the limits are. Note that it’s always best to phrase things in positive terms: if you say “don’t dump it all over the floor” then the image you create in their head is not what you want! Instead say “let’s keep it all in the bin” and “move the bucket here so when you pour all the material stays here” and so on. Children often want to carry sensory materials away to other parts of the room – remind them that it all needs to stay there. They also like to bring other things in to try them out. Teach them – “ask a grown-up before adding anything.” In our class, we have the rule of “be creative, not destructive.” If they ask us about something and it’s fun and creative and will do no harm, we always say yes, even if it means that things are being used in ways we never intended. However, if anything will get harmed or ruined, we say no. If children are having a hard time following the rules, we will move them to another part of the room, or if it becomes a chronic problem in a class on a particular day, the sensory table goes on time out – we put the lid on and we’re done. Some preschools keep a dustbin and small brush under the sensory table and a trash bin nearby and encourage kids to do their own clean-up when there are spills. I like to be able to rescue as much of my spilled sensory material as possible and return it to the bin (to reduce costs of replacing and un-needed waste) but feel like there needs to be an adult eye on deciding whether a spilled material could be rescued or needs to be trashed. (Also, kids might accidentally dispose of add-ins I want to keep. Read more on Setting Boundaries with Sensory Play. Fine motor skills, strength, and flexibility. Eye-hand coordination. Spatial understanding – the meaning of empty, full, volume, weight – will the materials from this container fit inside that container? Social skills, language – As they play together around the table, children socialize, negotiate sharing tools, create stories together. 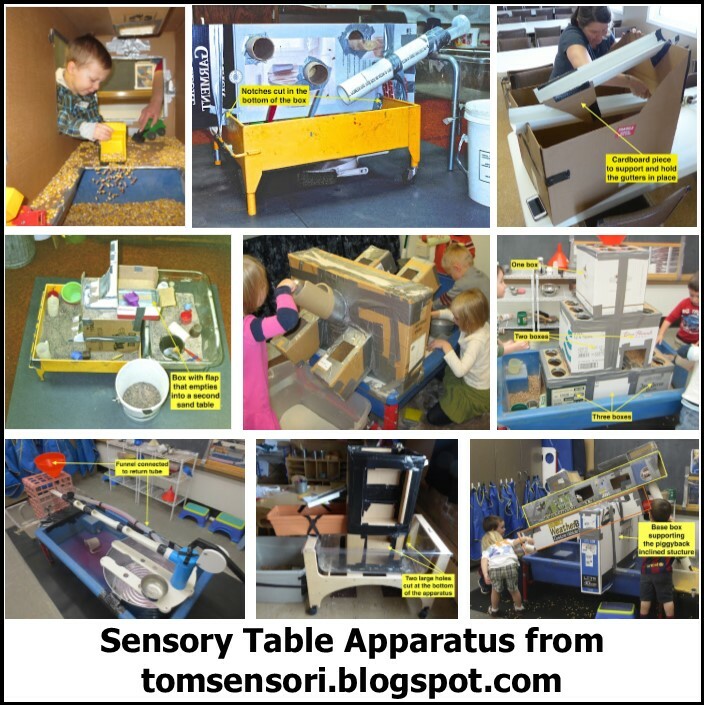 Sensory tables appeal to all ages and abilities. Every child can be successful. In my class, many kids are neurotypical, but some have sensory processing issues, autism, or ADHD. The materials seem to give them the sensory input they need in order to stay focused on other learning activities for longer times. I teach a multi-age class, with children ranging from 2.5 to 7 years old, and they (and the adults) all spend some time at the sensory table each day. There’s just something soothing and relaxing about sensory play. 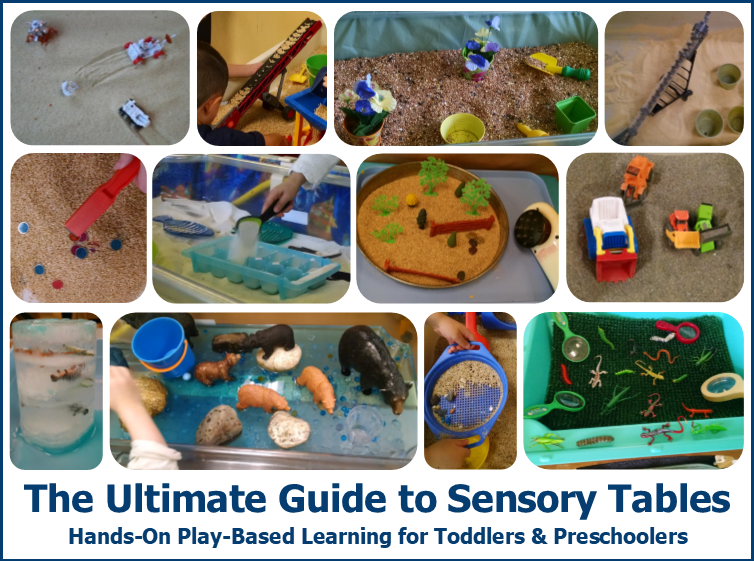 Read more about Why Sensory Play is Important for Toddlers on Not Just Cute. Little Bins for Little Hands is the single best source of ideas: start on one of these pages for links to lots of specific ideas: 40 sensory bins collaborative series, Rice sensory bins for holiday and seasonal themes, and Complete Guide. Early Learning Ideas also has a huge list, which I found just as I finished compiling mine! And, of course, you can search Pinterest for countless ideas for sensory play. Also check out my Ultimate Guide to Water Tables post. Awesome post! I love how you listed down all the possible things that we can include in a sensory bin. It sure makes things easier for us newbies! I will definitely try this again with my nephew. He just loves scooping and pouring so much! Thanks for this article. I find it very helpful and informative.